After delivering the Berenice to the East India Company, Napier resolved to make an effort to obtain an order from the British Government. This was an extremely difficult matter to manage, as conservatism overruled all other considerations,—Messrs Watt, Maudslay, Seaward, and one or two others being considered by the Authorities as the only firms worthy of being entrusted with Admiralty engines. Napier, however, had now some powerful friends, and owing to his European reputation his claims could not be overlooked ; so in 1837 he was afforded an opportunity of tendering to the Government, but no business resulted at that time. His first successful tender was made in the spring of 1838, when he was asked to offer for one or two sets of side-lever engines of 280 N.H.P. In view of present-day practice, the details of this offer are simple and interesting, and we reproduce them. The whole of the engines and machinery guaranteed to be equal to the best made in Britain, and finished to the entire satisfaction of the Lords Commissioners and their engineers. . This tender was accepted, and the engines were fitted in the Vesuvius and Stromboli, vessels which took a prominent part in the bombardment of Acre. H.M.S. Vesuvius, Beirout, February 1843. Dear Mr Napier,—You will no doubt, and with very good reason, call me a shabby fellow for not writing you since I have had the pleasure of being carried so far by a pair of your incomparable engines; but I trust it will be a satisfaction to hear that they have done their duty well, and are now almost as efficient as when they left Glasgow. I am proud to think they have been no expense to Government for repairs since we have been on the station. . . . The Stromboli is at Constantinople, where she has been lying some time with little work; but I believe she is still in perfect order about her engines. . . . There has no vessel done her work equal to the Vesuvius; always been ready when wanted, never had a screw loose. . . .
Several of your old apprentices are out here. I send you a small calculation of what we have done since we have been employed the two first years. In grateful recollection of kind attention to me. I hope yourself and family continue to enjoy health and prosperity, of which I shall be glad to hear if you have leisure.—Believe me, yours very truly, Erasmus Ommanney, Captain. In the meantime there was a cessation of orders from the Government, probably from a desire to return to the old restrictive policy of limiting the field to English engineers. Napier, however, was not a man to be set aside lightly, and he had powerful friends. He was confident in the superlative excellence of his work, and, much to the annoyance of Sir W. Symonds, who was then Surveyor of the Navy, Mr Robert Gore moved in Parliament for a return of the names of marine-engine makers with whom the Admiralty had made contracts for engines from the year 1839-1843 inclusive, with the amount of horse - power ordered from each of such engine-makers in each year; of the original cost of the engines of her Majesty’s steam-vessels, Alecto, Devastation, Geyzer, Cyclops, Prometheus, Polyphemus, Vesuvius, and Stromboli, specifying any extra charge beyond contract price, and if such engines were fitted with an indicator; of repairs and the cost of such repairs, and the number of days and hours any of said vessels were incapable of performing their work in consequence of such repairs, and of the names of the makers of each of the said vessels. 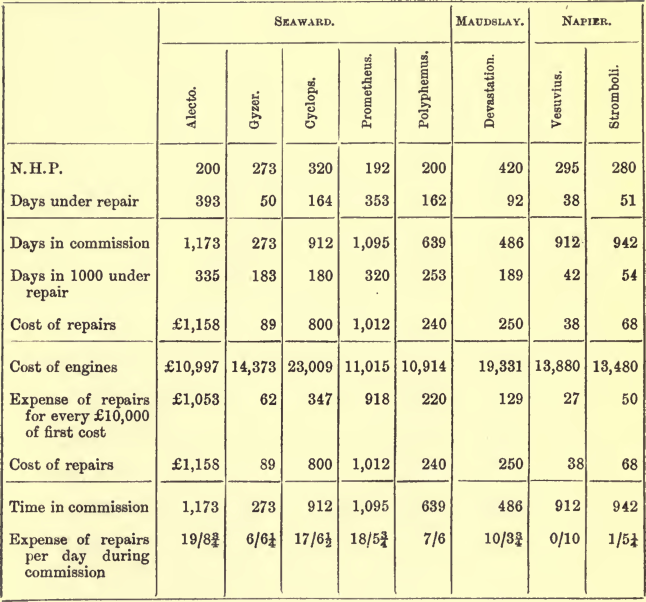 As the table sets forth, Napier’s engines were shown to cost the nation at first less money than those made by the English contractors, and also to compare most favourably with them in the amounts spent on repairs. As a result, from that time forward he became one of the most trusted of the Admiralty’s contractors and advisers. One of the first requests they made to him was for advice on the Boiler question, which seems, even at that early date, to have been troubling the official mind. As his reply is instructive, we give a long extract from his letter. “ To the Secretary of the Admiralty. “Sir,—In complying with the request of my Lords Commissioners of the Admiralty, as contained in Sir John Burrow’s letter of the 8th February, regarding tubular boilers, &c., I have been led, by the consideration of the subject, to take a more general view of steam machinery and vessels than I had at first intended, and have now the honour of submitting to my Lords the following statement received from James Napier (i.e., his brother), giving his experience in the construction and use of Patent Tubular Boilers in steam vessels from the year 1831, together with my views of boilers and machinery for steamers. 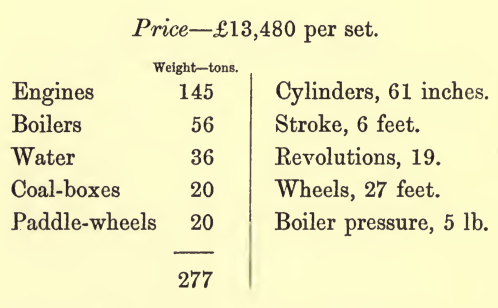 In 1831 I constructed boilers for the Aimwell steamer, having tubes 4 inches in diameter and 8 feet long; in 1832, boilers for the Duke of Lancaster, having tubes 5 inches diameter and 9 feet long; in 1833, boilers for the Royal William, from Leith to London, with tubes 7 inches diameter and 14 feet long; and subsequently boilers for the Royal Adelaide and Royal Victoria, also from Leith to London, with tubes 8 inches diameter and 16 feet long; in 1840, the Bonnie Dundee, with tubes 11 inches diameter and 14 feet long,—all of which gave entire satisfaction. From the above examples, and a number of others, it was found that from 4 to 6 feet of communicating surface in tubular boilers was as effective as 8 or 10 feet in common boilers, and that in all tubular boilers it required great attention to be paid to have ample area for draft. . . . I have in general found it advisable to have tubes of larger diameter in order to ensure a good draft and proper combustion rather than tubes of a smaller diameter with the same area, although the latter might contain more heating surface, and this more especially for vessels intended for long voyages or for general service where bituminous coal, giving out a good deal of smoke, must frequently be used. ... It has been found by experience that the quantity of heat communicated to the water is fully three times more in the fire - box than in the tubes, the surfaces in both being equal. This, in my opinion, does not arise solely from the greater intensity of heat in the fire-box, but also from the heat resting on, or passing along, the surface of the fire-box with a lower velocity than in the tubes, which confirms what I have advanced in regard to the advantage of large tubes in preference to very small ones. 3-inch tubes, 7 feet long for 150 horse-power. 4-inch tubes, 8 feet long for 200 horse-power. 5-inch tubes, 9 feet long for 250 horse-power. 6-inch tubes, 10 feet long for 300 horse-power. 7-inch tubes, 11 feet long for 380 horse-power. 8-inch tubes, 12 feet long for 400 horse-power. “Although it may be held as an axiom that the greatest amount of power with the least weight carried and the smallest space occupied by machinery are beneficial for a vessel, this, when applied to boilers and machinery, may nevertheless in practice be carried to an extent that would be highly improper and injurious. “For example, tubular boilers, if constructed to contain only a very small quantity of water with a very large amount of heating surface and a very small area of ebullition and separation, are unfit for giving out heat in a regular steady manner, and of being maintained in a proper state under the most skilful and careful arrangement, but will on the contrary vary sensibly with every increase or diminution of the intensity of the fires. . . .
“The injurious effect is even greater, in my opinion, in regard to steam-engines when concentrated in the smallest space with the least quantity and weight of materials. . . . Whenever machinery is carried to the extreme of lightness in its proportion as compared to power, and the different parts so crowded and concentrated together, its efficiency and durability can hardly fail of being impaired, even when the very best quality of materials, combined with the greatest care, skill, and attention, are employed in construction. . . .
“From the experience I have had for many years in constructing and fitting out steamers of all kinds for war and mercantile purposes, and the many opportunities I have had in the course of business of seeing and examining almost every variety of steamer, and of learning the great exertions that other countries have been and are making for ascertaining the best forms and proportions for vessels and engines for the purpose of establishing steam navies with the view of competing with that of this country, I trust my Lords will pardon the liberty I take in making a few observations and suggestions relative to this subject. “I am aware that many experienced officers and others connected with the Navy are of the opinion that steam-vessels for the purposes of war and ocean navigagation should have the length only equal to about five times the breadth of beam. In so far as the strength of ships is concerned these short proportions may be quite unobjectionable, but before any vessel can be entitled to be called a good steamer she ought not merely to be strong, but in every other respect to be completely suited and adapted for the particular service on which she is to be employed. . . . In those days the Admiralty were by no means pioneers, and it was only after the difficulties connected with experimenting had been successfully overcome in the mercantile marine that what were no longer novelties were adopted. A very different state of matters now prevails at Whitehall, where the opposite course is followed, and costly experiments are occasionally resorted to, often with disastrous results.